Conwy, (known in English as Conway, rather than the Welsh version), is a small town located on the coast of North Wales at the estuary of the River Conwy. It is a walled town with both trains and roads having to go through the walls to get to the town center. It is a quaint town of the middle ages with a large castle built by Edward 1 in the thirteenth century. The reason I would like to go back to Conwy is because I have happy memories of our time spent there as a family. Our boys in their teens were able to scramble all over the castle, up and down towers and waving to me in a heart-stopping way from the top of of the unfenced towers. We ate dinner at a wonderful fish and chip restaurant across the road from the castle. In the narrow main street of the town there are some other tea shops where they serve absolutely delicious cream teas, some in Victorian style rooms and some located in small flower-filled cobbled gardens. There are book shops, art galleries and gift shops full of Welsh crafts. Turn a corner off the main street and you are at the harbor. There you can find the Smallest House in Great Britain which is approximately 9 x 3 feet with a ceiling height of less than six feet. To crown it all the harbor has enough boats to keep my husband happy and the boys too, for that matter. One last thing. I have been to Conwy numerous times and each time the sun was shining! I went there in the 1970s when I was a student- would love to go back sometime. We've enjoyed a trip to Conway too, but no sun. Lovely little town. Such a lovely story to go with your impressive drawing. The castle looks very solid and imposing. Great job! Wonderful drawing. hope you get to go there again one day. Thank you, chris, for your addition here. Lovely. I say!! Chris you made me cry of homesickness kind of as I am longing to go to Conwy too and all around Wales ( I live in Denmark) I am sure I will go there one day I am sure. 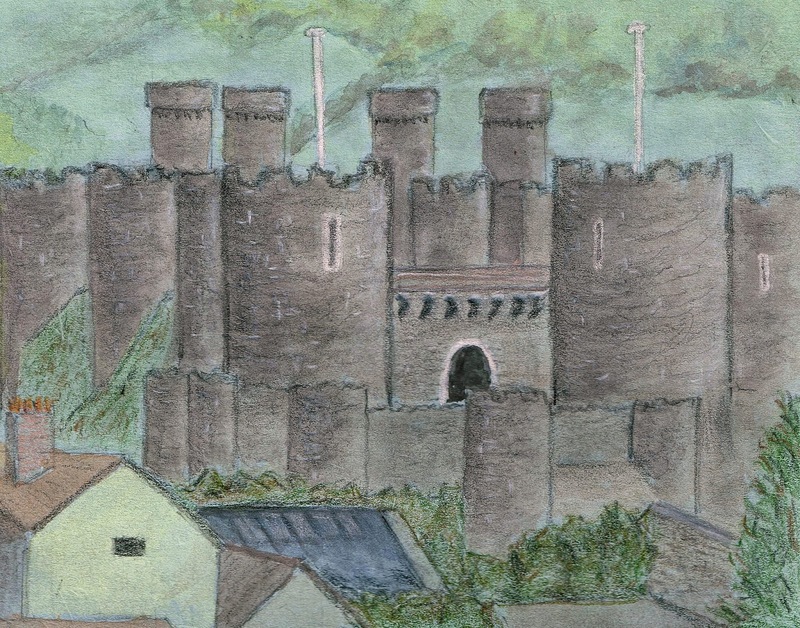 Chris, I absolutely LOVE your art of the North Wales castle! You have such an intricate way of drawing and painting, yet it makes me feel as if I could do the same easily and that inspires me to keep on painting - I REALLY LOVE IT! You mentioned on my blog that you have been to Cannon Beach - what a small world it seems to be! When I am in Cannon Beach with my four kids and Husband, I see and hear people from many different languages - it's beautiful! lovely work, now I want to go to Wales! It is so good and precious to have happy memories of the past. Looks like I have stirred up some memories with my post on Wales. Conwy is a nice place and it was sunny the day we were there. I hate to think what it will do to you when you see where we have just been these last few days. Just a clue, the cliffs are white and the coves are small and rocky.